Bensouda underscored the need for the Security Council to follow up on its referrals to the ICC, calling for the appointment of a single focal point for interactions between the Council and the Court. The prosecutor also urged the Council to use clearer language regarding states’ obligation to cooperate with the Court when referring situations to the ICC, and to take a proactive stance on arresting suspects wanted by the Court. Additionally, Bensouda called on the Council to consider the lack of funding for its referrals, stating that it has had an impact on her Office’s ability to conduct full and effective investigations in Darfur and Libya. The CAR government plans to create a rapid intervention unit to rebuild its army and help stamp out inter-religious clashes. The interim president said that the peace dialogue in the country had been delayed, and that reconciliation and elections are needed. An International Peace Institute columnist argued that ending impunity is crucial to peacekeeping efforts in the CAR. The Kenyan government requested that the Assembly of States Parties (ASP) discuss at its December session alleged misconduct on the part of the ICC in the Kenya situation. The Kenya Human Rights Commission’s Esther Waweru told the Standard that Kenyan criticism of the ICC is misplaced, since judges have yet to rule on the status of President Uhuru Kenyatta’s trial, and argued that the Court is the only institution offering any hope of justice to victims. Kenyan civil society said that the government is attempting to curtail their actions because they support the ICC judicial process. The Kenyan opposition promised to shoot down legislation increasing government oversight over civil society. The head of Kenya’s truth commission said that he is alarmed by recent violence between supporters of the CORD and Jubilee coalitions, warning that it could lead to widespread violence. A youth participant in Kenya’s post-election violence said that seeing Kenyatta and others at the ICC helped him to realize the folly of his actions. A Star columnist urged Kenya not to withdraw from the ICC, arguing that to do so would be to return to dictatorship. 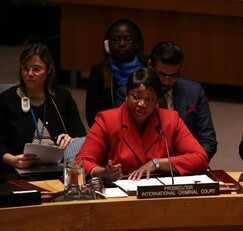 At a symposium convened by the Darfur Women’s Action Group, ICC Prosecutor Bensouda stressed the importance of bringing to justice the alleged perpetrators of grave crimes in Darfur. The UN secretary general said that an internal probe found no evidence to support claims that UNAMID covered up attacks by Sudanese forces on civilians in Darfur, but found that some incidents were under-reported. The whistleblower who made the allegations decried the UN’s internal probe, saying that it was not the ‘thorough, independent and public inquiry’ the ICC prosecutor had called for. Sudanese President Omar Al-Bashir reportedly ordered a ‘decisive attack’ to end the rebel movements in Darfur, South Kordofan and Blue Nile. Two peacekeepers and a child were injured in a militia attack on UNAMID in North Darfur. Sudan’s ruling party finalized its choice of Al-Bashir as its candidate for the 2015 presidential election. ICC prosecutors asked judges not to grant Bosco Ntaganda interim release. A new report tracks ICC wanted Joseph Kony’s movements over the past 10 years. Amnesty International (AI) accused Libya’s militias of committed widespread human rights abuses, including war crimes. The UN’s special envoy to Libya said that factional fighting is pushing the county to the point of no return. Heavy fighting in Benghazi killed at least 130. No Peace Without Justice called for Europe and the rest of the international community to develop a concrete strategy to support Libya’s transition, with an emphasis on justice and accountability. A French soldier was killed in clashes with Islamist fighters in northern Mali. Three UN peacekeepers were injured when a blast hit their vehicle near Kidal. The International Center for Transitional Justice convened a high-level conference in Abidjan to discuss Côte d’Ivoire’s progress in investigating and prosecuting serious crimes committed during the 2010 post-election violence. ICC judges refused to grant Laurent Gbagbo temporary release to attend his mother’s funeral due to security concerns. British forces handed control of their last base in Afghanistan to Afghan military forces. Georgia’s prime minister offered for South Ossetia and Abkhazia to have autonomous republics within Georgia. Colombia’s prosecutor met with ICC prosecutors to discuss Colombia’s progress in investigating and prosecuting crimes alleged committed during the 50-year conflict (in Spanish). One of the FARC rebel groups’s senior military figures—who is accused of several alleged atrocities—joined peace talks in Cuba. According to a new study, about half of FARC fighters were minors when they joined the group. Human Rights Watch (HRW) published a report documenting the abuses endured by Nigeria‘s Boko Haram abductees. The Nigerian government said that it is in talks with the group, but the Boko Haram kidnapped at least 25 girls in northeastern Nigeria and captured the town of Mubi. Nigerian President Goodluck Jonathan said that allegations of human rights violations by the military are exaggerated. The International Federation for Human Rights (FIDH) called for Ukraine’s newly elected government to extend the ICC’s jurisdiction to include the whole country and to ratify the Rome Statute. AI issued a call for pledges by ICC states parties at the 13th ASP session to strengthen their support for and cooperation with the Court. The ASP is unlikely to discuss Kenya’s proposed amendments to the Rome Statute, which would provide immunity for sitting heads of state, during the upcoming ASP session, the Star (Nairobi) reported. In a suit brought by the Southern African Litigation Centre and the Zimbabwean Exiles Forum, South Africa’s constitutional court ruled that South African police are obliged to investigate allegations of torture in Zimbabwe under legislation implementing the Rome Statute. Palestine’s chief negotiator said that Palestine will join the ICC if the UN Security Council doesn’t commit to establishing an independent Palestinian state by 2017. International lawyer Toby Cadman argued that Palestine should join the ICC, not use doing so as a threat to force concessions from Israel. HRW’s Param-Preet Singh told IPS that the commission of inquiry on North Korea has created momentum to refer the situation to the ICC. At least 43 countries have lent their support to a draft Security Council resolution that would refer alleged North Korean crimes against humanity to the Court. The UN special investigator for North Korea urged the UN Security Council to refer North Korea to the Court and asked states to arrest alleged perpetrators. North Korea has indicated that it may allow a UN human rights investigator to visit the country. FIDH, REDRESS, Track Impunity Always and the European Center for Constitutional and Human Rights are launching a new report on victims of serious international crimes in the European Union. The International Bar Association awarded Odhikar’s Adilur Rahman Khan its 2014 Human Rights Award. The ICC prosecutor spoke at a conference on child soldiers at the University of Georgia. Meanwhile, the ICC held a seminar for counsel and the legal profession in Dakar, Senegal. The ICC received a communication accusing the CEO of Chevron of alleged crimes against humanity in Ecuador (in Spanish), but law professor Kevin Jon Heller argues that an investigation is unlikely. Academic and blogger Mark Kersten examined the risks and benefits of investigations of atrocities by private NGOs in Syria.